Ice-World > Knowledge center > How does the Ice-World system work? How does the Ice-World system work? Ice-World’s mobile ice rinks are built up out of foldable aluminium elements which are 1 metre wide and available in various lengths. They can easily be connected to one another using quick-fit connectors. The design has been patented worldwide. In this article we will take a closer look at all the different components that ensure that everyone has a great time on the ice! An end pipe (we call this an end header). An Ice-World ice rink consists of aluminium elements that are connected to one another by means of small flexible rubber hoses. You can build an ice rink of any desired size by connecting multiple elements together. 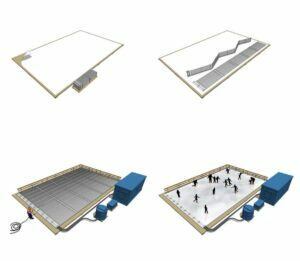 Because the elements can be folded into compact packages, the ice rink can be transported easily and installed quickly. The refrigerant is pumped through the chiller, where the glycol is cooled to -10°C, from the buffer tank. The glycol is then pumped from the chiller to the connected ice rink elements through the flow pipe system. Because the refrigerant in the pipes is colder than the surrounding water, this system will absorb the warmth of the water. As a result, the temperature of the refrigerant will rise to -6°C during its passage through the ice rink. When the glycol is discharged from the ice rink it will flow into a buffer tank from which it will once again be pumped through the chiller in order to lower its temperature. The cycle then repeats until all the water is frozen. Weather conditions and the ground temperature may make it necessary to continue cooling the ice rink, even after the ice has formed. In winter, when the outdoor temperature is lower, the cooling system will only use a quarter to a third of its maximum chilling capacity. Depending on the ambient temperature it is sometimes not necessary to operate the chiller at all because the aluminium system conducts cold so well. The use of aluminium means, first of all, considerable energy savings. Because aluminium is a good heat conductor, warmth from the water is absorbed more easily and the water is therefore chilled faster. As a result, the ice rink uses up to 40% less energy. This is better for the environment and makes a substantial difference in operating costs. Exposure to the elements (wind, rain, sun) and the ground’s natural heat will always cause an ice rink to heat up. Thanks to the aluminium system the effect of the ice-chilling system produces faster and better results, making the ice less susceptible to weather conditions. As a result, the ice floor will quickly dry after a shower and the rink can remain open at ambient temperatures up to as high as 30°C. A third advantage of aluminium is that there is hardly any risk of leakage. Aluminium does not attract dirt as quickly and is sturdier than plastic, making it less susceptible to wear and damage. Thanks to the smart construction of the Ice-World ice rink elements and the excellent chilling capacity of aluminium, the rink is often ready to be skated on within 24 hours. After all, the more days that the ice rink is open, the more profit it will generate! Would you like to know more about how our ice rinks can be made ready to skate on within 24 hours? If so, please read the article: Step by step: building an ice rink in 24 hours.